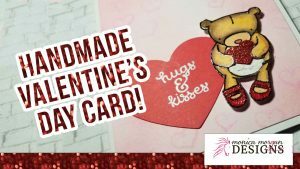 After I stamped the cutest little bear ever, I heat embossed it with clear embossing powder. My heat tool melts the embossing powder that I have over the black ink so it makes it a little bit raised. It’s embossed. If you touch it you can feel it. It’s the coolest thing ever! So that’s gonna help me with my coloring. I used Artist’s Loft alcohol markers and they’re brand new and I’m brand new to alcohol marker coloring so but I have good news… today I actually ordered a set full 72 piece set of Copic Sketch markers! 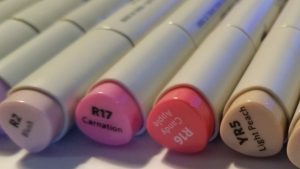 This is some of the blending that you can do with this these kind of markers. I am going to be doing a video series on my Copic journey so hopefully, you’ll subscribe and learn with me. I don’t know what it is about embossing but I just love it. I gave her little red ruby slippers it just came out so cool, the shading and everything! Now I’m gonna have her hold a little heart and in order to do that I’ve got to cut her arms open so she can carry something. I got this little punch for about $2 from Joanne’s. I am a thrifty kind of gal. I’m gonna fussy cut which means you cut out the image by hand. I used a red glitter gel pen for her nose to match her heart and her shoes. I used new brushes to blend and create my own background paper that I bought from Amazon for only $14.99! 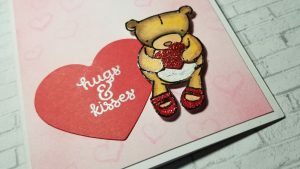 Now I am adhering my lid to my card base and I’m going to pop up my little teddy bear with some foam squares. I get these from the dollar store and then they come in a roll and I just trim them how much I need them. I decided not to do anything else because I thought it was sweet and simple as it was and I really think sometimes less is more. I’m so happy with you her! I hope you enjoyed this little tutorial and I will be bringing lots more! I have so much to bring please give me a thumbs up and subscribe to my channel! AFFILIATE LINKS AND DISCLOSURE: I participate in affiliate programs when possible. This means when you purchase a product from a link I provided I am compensated for this. This is at no extra cost to you and works for everyone involved! All of the products I used in this video were purchased by myself. I am also a participant in the Amazon Services LLC Associates Program, an affiliate advertising program. Listed below are products used in this video. If the product was not available, a similar product is shown.